So we've got good news and bad news. Published: 2014-05-08, by Manu Galvez. "Search and find the cheapest flight tickets"
Skycanner allows you to find flights, no matter where you are or where you want to go. The app is quite simple: you just need to introduce departure location and destination, departure date and comeback date and how many people is flying (and if they're adults, kids or babies). Click on search and you will get lots of results, different prices, companies and hours. Actually the app is quite simple and its strongest point is its huge database. Bear in mind that Skyscanner is a successful flight web browser. It keeps your searching history. Once you choose the one you prefer you can share it or book it, from the app. That's basically what you can do. We're missing though other great features that there are available in the website. Basically, the "No matter date" option, if you have full availability and you want to find the cheapest flight tickets. Besides these little catch, the app is set in a good-looking layout, easy to use and understand. Skyscanner - All Flights has been developed by Skyscanner.net, the official flight web browser. If you really love to travel, you will really appreciate having an app to check out flight ticket prices in your phone. Skyscanner has a huge database that a great amount of flying companies, so it's reliable in this sense. 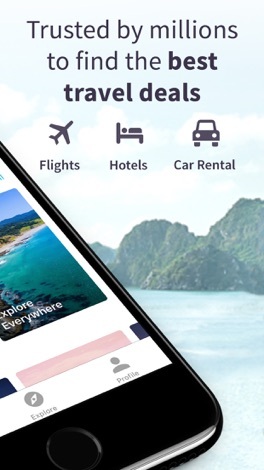 Skyscanner is an all-in-one travel app with flights, hotels and car rentals, all in one place. 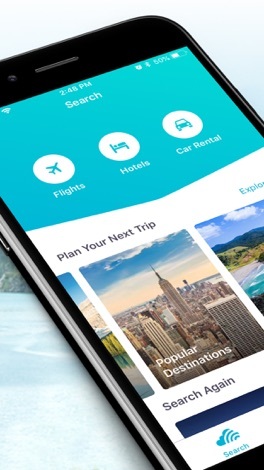 Travel smarter with our app by instantly searching, comparing and booking cheap flights, hotels and car rentals anytime, anywhere. Independent, unbiased and completely free, we find you the best deals in seconds. 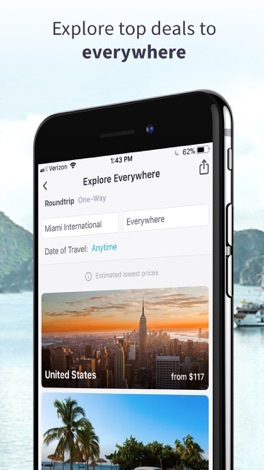 Book your next trip with our award-winning, easy to use app brought to you by the world’s travel search engine. Now available in over 31 languages. Easily find and compare the cheapest days and months to fly with our color-coded calendar and chart view. We don’t charge any booking fees – so no hidden charges, just cheap flights. Never miss a deal. 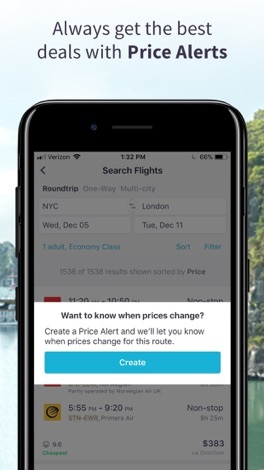 Get notified of any price changes for flights with automatic price alerts. Unsure of where you want to go? Earn frequent flier miles by booking via our app where applicable. Not sure where you want to go on your next trip? Get instant inspiration by selecting ‘Everywhere’ in the destination box and let us brighten your day with cheap flight prices to places around the world. You can also find the best deals from your nearest airport with our Top Deals feature. Compare great hotel deals from hundreds of thousands of hotels, resorts, apartments and hostels. Find rooms near your current location. Even search last minute hotels for tonight. Just looking for inspiration? 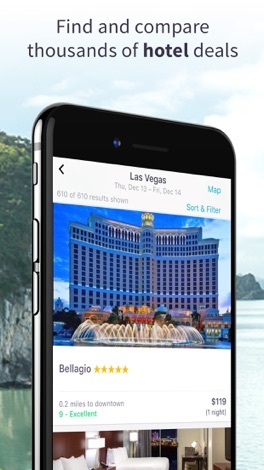 Search for hotels in all your top destinations and dig out some great deals. 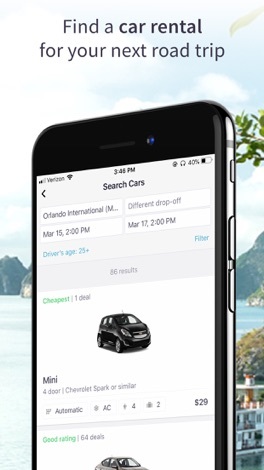 Search the world’s car rental companies in seconds. Choose from 30,000 airport or city locations, then filter by vehicle type, fuel type and features to find the car you want at the right price. What’s more, our Fair Fuel Policy flag will make sure you don’t get ripped off on fuel. Log in to sync your flight searches and price alerts across all your devices - phone, tablet and desktop - so you can plan your trip anytime, anywhere. No booking fees or hidden charges, just the best prices on flights, hotels and car rentals.